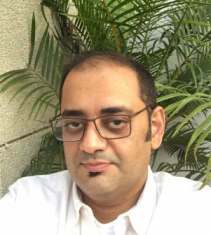 Mohit Verma is a research oriented professional, exploring a sustainable & ecological design approach in his practice for the last 15 years. His formal education includes a Bachelors in Architecture from the TVB School of Habitat Studies and Masters in Ekistics from Jamia Milia Islamia. He manages a team of architects, consultants & project managers for a whole range of projects including master planning, town planning, institutional, commercial, architecture & heritage conservation projects. For the last 10 years he has been teaching as a visiting faculty in institutions like Jamia Milia Islamia, Sushant School of Art & Architecture , and School of Planning & Architecture Delhi. He is the founder director of a NGO ARCHADE foundation, which is dedicated to architectural research, conservation, habitat design & architectural education. 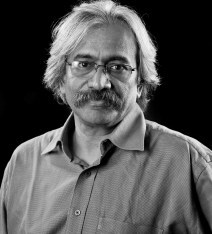 A Photographer par excellence, an educator and a mentor, a graduate of NID Ahmadabad, Shailan Parker has been offering professional photography services for last 30 years. His client list includes some of the top names like Lintas, HTA, ITC, Tupperware, Nestle, Lehar foods, TATA Telecom, Mahindra & Mahindra, Godrej, Whirlpool, Oxfam, etc. Shailan has also done two solo shows. He has been a visiting faculty at NID, IIFT and IICD. Sinashi has been teaching design since 1999 and has served as Dean (Academics) at different design Institutes. As a design educator her areas of interest are basic design and research; Colour; Textiles for spaces and apparel; Craft; Environmental Studies and inter-disciplinary design activities. She also mentors students undertaking their final graduation projects with the industry. Her core specialisation is Textiles. Having studied Textile Design as an Industrial Design student at the National institute of Design, Ahmedabad, she has explored and experimented with the medium creating textiles for interior-exterior spaces and apparel, working for the domestic and overseas markets. Flora International, M.A. Trading, D.C. Handlooms, UNDP, Ravissant, Lakshmi Mills and Anjuman Fashions are some of the organisations and companies she has been associated with. Products designed by her as a textile designer have been exhibited and sold from international fairs like Heimtextil Frankfurt; Domotex Hannover; Maison et Obect Paris and Carpet Fair Atlanta, USA and domestic fairs like Heimtextile India, Ambiante India, Texstyles India, The Carpet Expo and the Indian Gift & Handicraft Fair. She has also designed and executed the display areas in these fairs for the companies she was associated with. 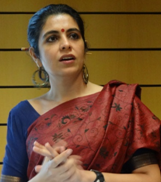 Dr. Anvita Arora, is an architect and transport Planner, with a PhD from the Civil Engineering Department of the Indian Institute of Technology (IIT), Delhi in 2007. She is the Managing Director and CEO of Innovative Transport Solutions (iTrans), an incubate company of IIT, Delhi. 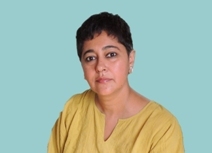 She has also been teaching Transport Planning in the Urban Design Department in the School of Planning and Architecture (SPA), Delhi for the past 11 years and is visiting faculty at the TERI University, Delhi and Ansals University, Gurgaon. Ameet Babbar has been educated in new delhi and England as an architect, and then did a post-graduation in landscape architecture from the prestigious school of planning and architecture in new delhi. Ameet Babbar has been a practicing Architect for over nine years. He worked on a number of important & prestigious projects of varied scales with reputed architectural consultants and designed several building complexes including multi-storied buildings, architectural & infrastructure development projects in delhi and various parts of the country. Paola is a graduate (Laurea) in Philosophy from Università degli Studi di Milano receiving the academic title of ‘Dottore in Philosophy and holds a Vocational master in Linguistic: for teaching and promoting Italian language and culture to foreigners from Università degli Studi di Milano. Her thesis was the first research of comparison between Italian and Tibetan language, where, she tried to explore the strategy to teach Italian to Tibetan speakers. She has experience in teaching Italian language and culture to Indians as she works for Italian embassy cultural Centre, New Delhi. Born in 1987, New Delhi, Aditi Aggarwal is a visual artist based in Noida. She holds M.F.A. (2013) and B.F.A. (2010) in Painting from College Of Art, Delhi University. Currently working as a Research Scholar at Lalit Kala Akademi’s Garhi Studios, she was awarded Gold Medal during MFA degree and Sailoz Award during her BFA final year with respect to academics. She is a recipient of H.R.D. National Scholarship, Ministry of Culture & Camel Art Foundation Award‎. Between 2014-15, she worked as an Associate Researcher for Sangeet Natak Academy and for The Museum of Sacred Art, Belgium (Delhi Chapter).‎ Her work has been exhibited at KalaKriti Art Gallery (Hyderabad), Art Heritage Gallery, Sanskriti Kendra Anandgram , Lalit Kala Akademi etc. Her teaching experience includes teaching at College Of Art, New Delhi, Workshops at Jawaharlal Nehru Architecture and Fine Arts University, Hyderabad and Janki Devi Memorial College, DU. Mansoor Ali has completed his Masters in Fine Arts (Sculpture) from the Faculty of Fine Arts, M.S. University of Baroda in 2004 and Bachelors in Fine Arts in 2002 from the same institution. His works were previously seen at the Durbar Hall Art Center, Ernakulum, Kochi (2008), Faculty of Fine Arts (2008), Gallery Maskara (2008), Sandarbh Artist Residency - Partapur, Rajasthan (2007). His works are in important collections in India and abroad including the Charles Saatchi collection. 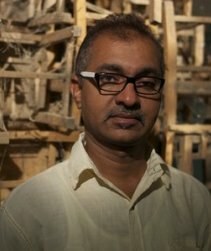 He was one of the featured artists in the Saatchi Gallery show ˜The Empire Strikes Back: Indian Art Today' (January-May 2010). In November 2010 his work was part of an exhibition at Artissima 17 (Art Fair), Turin, Italy. In 2011, his works were exhibited as part of group shows at Gallery Maskara, Mumbai, India and the India Art Summit (India Art Fair), New Delhi, India. Gayatri Singh has a Professional PG diploma in Textile Design from NID, Ahmedabad and B.Sc in Clothing & Textiles from MSU, Baroda. She is a visiting faculty for Design Management & Entrepreneurship at NIFT, Hauz Khas, New Delhi. 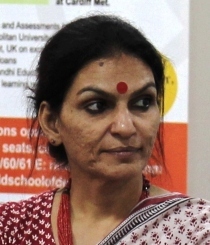 She was also Co-coordinator In charge of Uttar Pradesh for the Design Satellite Center of the NID, Ahmedabad. She was also appointed as a coordinator, North Zone, for the Design Clinic Scheme, launched by the Ministry of MSME, on contract basis. She was working as a Manager- Design & Product Development, at Avco Traders Pvt. Ltd. She was Head of Department NIFD, Kanpur Textile Depatment (2000-2003). He has a BFA in Applied Arts from College of Art, Delhi. He was an Associate Visiting Fellow at Kyoto College of Art & Design, Japan with Japan Foundation Fellowship. He is a freelance photographer. He has received several awards and fellowships for photography. He has many solo and group shows to his credits and curated photography shows. He has been visiting faculty for NIFT, Delhi, Udaan School of Photography, Delhi School of Photography among others. She has done Diploma in Industrial Design (Textiles) from National Institute of Design, Ahmedabad. 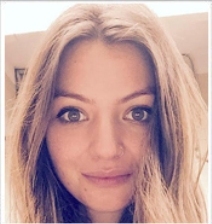 She has a wide experience in Textile design for both in fashion and interior sectors. She was a Visiting Faculty at NIFT, Delhi and NID, Delhi Cell. Besides this she also handled Graphics and Exhibition Projects. She has contributed regularly as an expert consultant on topics and articles related to home textiles/ décor. She also has a Diploma in Textiles from Institute of Design, Jaipur and a Diploma in Computer Programming from Birla Institute of Scientific Research, Jaipur. She also has a Certificate in Export Management from Indo American Society, Mumbai. He has a PG Diploma in Textile Design and Development from NIFT, Delhi. He bagged the Best Diploma Project Document award for the year 2001. He has a long experience working in the Textile industry, which includes working for SEWA, Ahmedabad, Suhag Textile, Delhi, IM, Sweden, AIACA, Lucky Textiles, Indonesia among others. He established MESH Design Studio and the founder of Sarg’s Designs Pvt. Ltd. He has done art installations at different public places. He is currently working as a Project Associate at IIT Delhi. 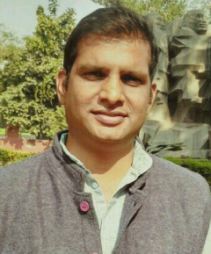 Allen is a Civil Engineer from Sardar Vallabhbhai Patel Institute of Technology, Vasadh currently pursuing his Masters from Teri University, Delhi. He also worked as a site engineer with Triveni Developers at Vadodra. He has worked as a volunteer at KURVE WUSTROW, Germany on facilitating inter cultural dialogue on sustainability & peace. He is a active member of OLAKH, an NGO working for the education & development of under privileged children in Vadodra. He is teaching Structural Design as a visiting faculty. 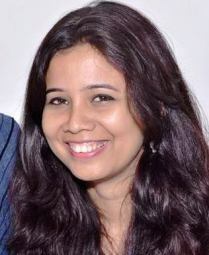 Shilpi is Gallery Manager at Stupa18 Gallery, Noida. She holds a BFA degree in Painting from College of Arts & Crafts, Lucknow University in 2010. 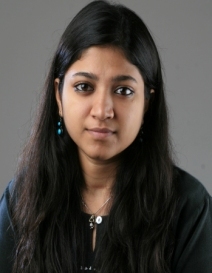 She completed her MFA in Art History from Jamia Millia Islamia, New Delhi in 2012 and qualified NET (UGC) in same year. She is currently working on a script writing project of UGC in collaboration with MCRC, Jamia Millia Islamia. 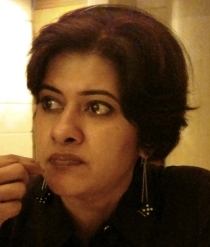 She has 3 years experience in art gallery management till date and has been part of various curatorial projects. Manjot Kaur is an interdisciplinary artist practicing painting, land art, video art, installation and performance. She studied visual arts in the field of painting and is now working vividly in the field of public and environmental art. Passionate about ecology, conservation and the ephemeral she likes to wander into natural places. Her research explores the impermanence and shared invisible bonds of existence that makes human more humane. She is recipient of Chandigarh Lalit Kala Akademi award, University Gold Medal for MFA 2012, Travel Grant to UK and many more. Her work is in collection of Govt. Museum and Art Gallery, Chandigarh; Private collection with eminent art historian BN Goswamy and others. She has participated in various national and international artist residencies. She is currently an associate member of Punjab Lalit Kala Akademi. 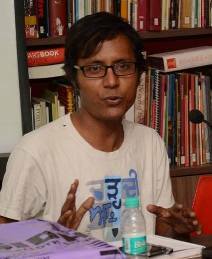 Samudra Kajal Saikia is a practitioner of interdisciplinary art practices (including performance, theatre, public art, creative writing, cultural criticism) and a researcher. 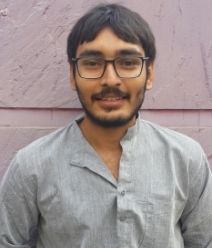 After completing BFA from Viswabharati, Santiniketan and MVA from M S University of Baroda (in Art History and Aesthetics) he co-founded a company to work in the media entertainment industries in New Delhi, and also co-founded art curatorial and pedagogical initiatives like Regional Art, Performance and Events (R.A.P.E), and Nine Schools of Art, New Delhi. He is practitioner of a distinctive performative practice that is coined as the Disposable Theatre instigating collaborations and cross genre experimentation. Samudra was the recipient of FICA Public Art Grant, 2010 before he receives the Ila Dalmia FICA Research Grant in 2013. He is also building the first ever publicly accessible digital archive of “Performance Art in India” for Asia Art Archive.